On Greentree road, by Bells Elementary School, a sign is in place to remind drivers of the consequences of distracted driving. The sign reads, “U Drive. U Text. U Pay,” which is the name campaign — effective in Washington Township through the month of April, which is Distracted Driving Awareness Month. Photo: Krista Cerminaro, The Sun. The Washington Township Police Department is participating in a statewide high visibility enforcement campaign in an effort to enforce distracted driving laws. The “U drive. U text. U pay.” campaign will run through April 30, corresponding with April being nationally recognized by the National Safety Council as Distracted Driving Awareness Month, according to Washington Township Chief of Police Pat Gurcsik. A $66,000 state grant will be shared between the Rowan University Police Department and 16 Gloucester County towns. Gurcsik said Washington Township will receive $5,500 in grant funds through the New Jersey Division of Highway Traffic Safety, to assist in providing police officers and roving police patrols that will ultimately enforce distracted driving laws. Additionally, Gurcsik said patrol officers are directed to spend part of their patrol day enforcing motor vehicle distracted driving offenses. “In an effort to decrease injuries and fatalities caused by distracted driving, we applied for the grant,” Gurcsik said. When the targeted law enforcement campaign concludes at the end of the month, Gurcsik explained each officer will be reviewed to see how many distracted driving tickets and warnings were issued. While Gurcsik said not all of the crashes were directly attributed to distracted driving, it’s probably the most serious safety issue on roadways today. “These are 100 percent preventable,” Gurcsik said. Gurcsik also noted the National Safety Council’s latest statistics show fatal accidents are up by 6 percent, and more than 40,000 people were killed on the nation’s roads last year. “Distracted driving was a major contributor,” Gurcsik said. 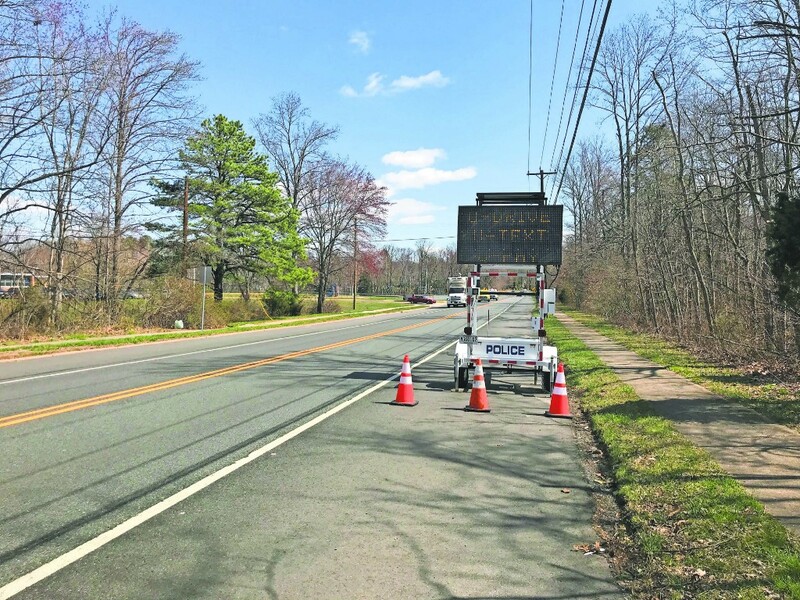 Gurcsik noted the Washington Township police department sees the most offenses on major roads such as Ganttown Road, Greentree Road, Hurffville-Cross Keys Road and Route 42 — all high-traffic areas. Other participating municipalities include Deptford, Glassboro, Clayton, Woodbury, Woodbury Heights, Greenwich, East Greenwich, Harrison, Franklin, Logan, Monroe Township, Mantua, Westville, Woolwich and Elk. According to Gurcsik, distracted drivers can face fines ranging from $200 to $400 for first offenses, not including court costs and a mandatory court appearance, which Gurcsik said entails spending a good portion of your day in court. Drivers can also be fined $400 to $600 for second offenses and $600 to $800 for third or subsequent offenses — including three motor vehicle points on their license and a possible 90-day license suspension — within a 10-year period. Although the campaign runs through April, these laws remain in effect in the state.